Ok, ok, I know. This is getting old. But I am obsessed with this Mango Salsa, and I will come up with 400 more ways to eat it. This one was amazing as well, inspired by one of the fish tacos I had in San Diego. This is pretty self explanatory for the most part. 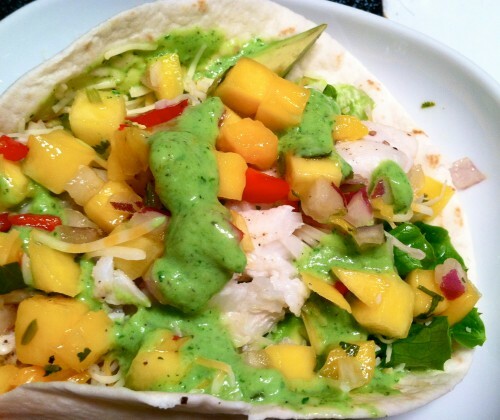 Some lettuce, some fresh avocado, any kind of white fish, some shredded cheese (not really necessary, but good nonetheless), and the infamous fresh mango salsa (that I will have to learn to make on my own if I ever move), and… ANDDDD…. avocado cilantro lime sauce. I looked up some recipes for cilantro lime sauce and they all called for some crazy stuff that I had not picked up at the store nor did I have laying around, such as sour cream. What?! Who needs sour cream when you have limes and skim milk. So, what could thicken that? Avocado. I was going to put it in the taco anyway. So I made up my own sauce. blend in a blender… and let me tell you, since my blender is ghetto, half the chunk of ‘cado I put in there didn’t even blend, and it was still good…. delicious I should say. This entry was posted on March 6, 2013. It was filed under Cooking.